(BEIJING, June 23) — The 5th Beijing 2008 Olympic Cultural Festival was declared open Saturday evening at the International Sculpture Park in Shijingshan District. During the ceremony, BOCOG President Liu Qi, who is also member of the Political Bureau of the Central Committee of the Communist Party of China (CPC) and secretary of Beijing Municipal CPC Committee, announced the official start of the fifth Beijing 2008 Olympic Cultural Festival. Chen Zhili, State Councilor and BOCOG First Vice-President, also attended the event and unveiled a piece of theme sculpture for the cultural festival. Liu Qi announces the official start of the cultural festival. Chen Zhili unveils a piece of theme sculpture for the cultural festival. The International Sculpture Park, located in the western part of China’s Capital, was alive and throbbing with an atmosphere of festivity. At 6pm, art performance and cultural activities are held in six special sections in the park, including a welcome area, a photo exhibit, a folk customs exhibit, a fitness area, an entertainment area, and stage performances. During the ceremony, local chorus teams, performance teams and disabled persons’ organizations brought their Olympic-theme songs and dances to the audience. Olympic champions and popular singers also went on the stage. Themed “One World One Dream — I participate, I contribute, and I enjoy”, this cultural festival integrates sports with culture, featuring about 110 sports and cultural activities ranging from Olympic live sites, films, forums, exhibitions, open-air concerts, and cultural activities for persons with a disability and the youth. This cultural festival is the fifth one in a row since its debut in 2003 and the last one prior to the opening ceremony for the Beijing 2008 Olympic Games. 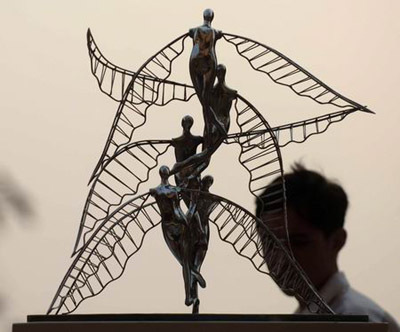 The 2008 Olympic Ornamental Sculpture International Roving Exhibition, described by experts as “the world’s largest known sculpture show”, opened in the square of the Guangzhou Museum of Art on December 1. A total of 281 masterpiece sculptures created by artists around the world will be on display for the next 10 days. The exhibition is jointly organized by the Organizing Committee of the Competition of Ornamental Sculptures for the 2008 Olympic Games, China Artists Association, the Publicity Department of the CPC Guangzhou Municipal Committee, and Guangzhou Municipal Culture Bureau. The exhibition features probably the largest number of exhibits and the highest professional standard even seen in China. Most of the works, made of high-standard bronze, iron, aluminum or stainless steel, have been selected from about 3,000 entries from more than 90 countries and regions around the world. 96 of them have come from abroad. At the exhibition, the organizers have set up five ballot boxes for visitors to vote for their favorite sculptures. Gold, silver and bronze medals will be presented in late 2007 to sculptors according to the number of votes received and experts’ evaluation. The Olympic spirit is taking shape in Wangfujing with the installment of 290 landscape sculptures celebrating the ethos of the games. Droves of enthusiastic, camera-toting spectators are descending on Beijing’s high-end shopping strip to ooh and aah over the works, pose for snapshots and cast votes for the work they believe deserves the gold medal. With the generation of such enthusiasm, the 2008 Olympic Landscape Sculpture Exhibition doesn’t only portray the Olympic spirit – it’s creating it. The exhibition is one of 28 events featured during the 4th Beijing 2008 Olympic Cultural Festival, which will draw to a close on July 15. The landscape sculpture exhibition will line the streets of Wangfujing until Monday. On Tuesday, the exhibition will hit the road on what is expected to be a 30-city tour, making its first stop in Tianjin in a little more than a week from now. From Tianjin, the exhibition will travel to Xiamen, Zhengzhou, Changchun, Taiyuan, Shijiazhuang, Ningbo, Nanning, Shenzhen, Hong Kong and Macao, as well as a number of major cities outside China to be announced. After the votes are tallied, the competition will conclude with a televised awards ceremony in the fall of 2007, where 29 gold, silver and bronze prizes (Beijing’s Olympiad will be the 29th) will be awarded to the sculptors with the most votes. Most works highlight themes of international unity, dream realization (in line with the Games’ “One World, One Dream” slogan) and the prospects of Beijing 2008. And in an exhibition where shape serves as the lingua franca, one shape representing all of these values dominates the conversation the Olympic rings. While pervasive, the use of the rings is kept from becoming too monotonous by the variety and creativity of the ways the Olympic icon is used as a basis for the creation of other forms. The rings sometimes appear in their traditional, stand-alone form, but more often than not, the artists tried to challenge their imagination to use them to form arms, legs, heads, pigtails, peach blossoms, pillar tops and tunnels. One of the best examples of such cleverness is “Dream Realization,” by He Jianjun of Guangdong Province. The interlocking rings form the torsos or other parts of the body for five stainless steel figures whose arms are thrust skyward in celebration. But they also serve as negative space between the figures. Figurines join hands to create interlinked loops coloured the respective blue, yellow, black, green and red of the Olympic rings in Yunnan artist Yang Xiaobo’s “The World Is a Family.” The idea is to portray how the Games foster increased interconnectedness of different people around the globe and succeeds on that level, although the craftsmanship seems too primitive. While sculptors from 56 countries contributed to the exhibition, the cultural essence of the subject matter is principally but not overwhelmingly Chinese. Traditional themes involving dragons, martial arts fighters and drummers and dancers abound, but the styling is overwhelmingly contemporary. One of the more striking pieces of paradox is “New Beijing, New Starting Point,” by Beijing artist Liu Bolin. It shows a terracotta warrior poised in a race-takeoff stance, possibly representing the way Beijing is dashing into a new era since its selection as the 2008 host city. “Kung Fu Soccer,” by Fujian artist Chun Lin, features a Chinese man in traditional garb administering a high kick to a soccer ball. More abstract pieces allude to other facets of Chinese culture and heritage. The stainless steel work, “Celebration of ‘Ren,'” by US artist Markt Weisbeck, takes the Chinese character for the word “people” into the third dimension by sculpting the character’s two concave baselines, which join at the top. It’s a bold execution of a simplistic form. A few other foreign works focusing on internationalism with a spotlight on China are worthy of note, such as Asherah Cinnamon and Scott Fuller’s “Reaching for Courage The Gateway to China,” in which several tiny figurines walk through a series of red, art nouveau-style archways, and the more abstract “China and the World Embrace in the Olympic Spirit” by Puerto Rican artist Celia Rodriguez, which shows red and blue folded trapezoids linked by a blue spiral. The 290 works on display represent what organizers are calling the best of the 2,433 pieces entered by more than 1,000 sculptors from 81 countries. The exhibition, therefore, can boast a particular honor as the largest manuscript solicitation for sculptures in Olympic history. Perhaps the most accessible exhibition of the cultural festival yet, the landscape sculpture exhibition is worth a visit for those hoping to whip their Olympic spirit into shape. (BEIJING, June 28) — Starting July 1, Hong Kong will be host for the “2008 Olympics Landscape Sculpture Traveling Exhibition” at Hong Kong Park, Xinhua News Agency reported. Slated to be on display for 10 days to celebrate the 10th Anniversary of Hong Kong’s return to China, the exhibition will be a zestful celebration of the upcoming Games of the XXIX Olympiad and the 2009 Hong Kong East Asian Games. 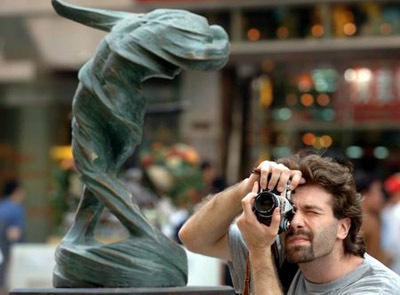 All sculptures are all constructed from copper, bronze or fiberglass. The exhibition in Hong Kong Park will be co-organized by Beijing Organizing Committee for the Games of the XXIX Olympiad (BOCOG) and varied art associations in China. Exhibition organizers selected 110 sculptures for this exhibition out of 2,433 submissions from 90 countries and regions submitted in 2005. The exhibit comes to Hong Kong after extensive exhibits throughout China and around the globe since 2006.